Do Hedge Funds Love Rio Tinto plc (ADR) (RIO)? Rio Tinto plc (ADR) (NYSE:RIO) investors should be aware of a decrease in support from the world’s most successful money managers of late. 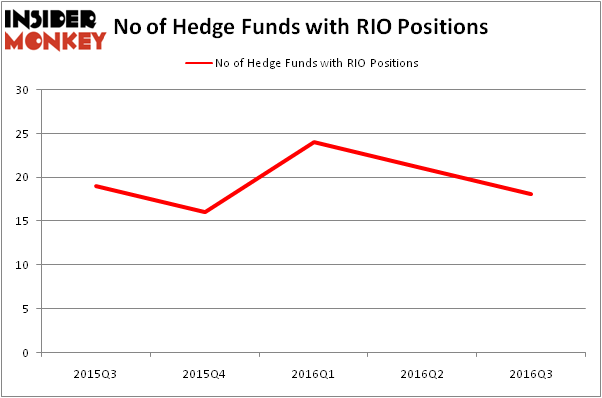 There were 21 hedge funds in our database with RIO holdings at the end of the previous quarter. The level and the change in hedge fund popularity aren’t the only variables you need to analyze to decipher hedge funds’ perspectives. A stock may witness a boost in popularity but it may still be less popular than similarly priced stocks. That’s why at the end of this article we will examine companies such as E I Du Pont De Nemours And Co (NYSE:DD), Banco Santander, S.A. (ADR) (NYSE:SAN), and Itau Unibanco Holding SA (ADR) (NYSE:ITUB) to gather more data points. 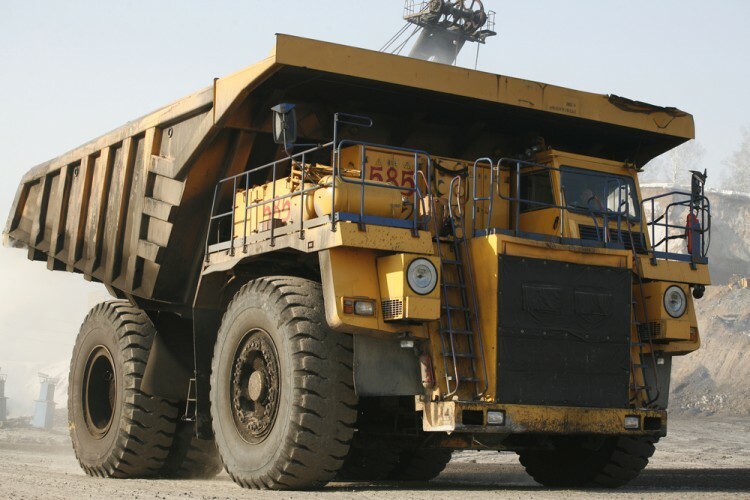 Now, we’re going to check out the recent action surrounding Rio Tinto plc (ADR) (NYSE:RIO). What does the smart money think about Rio Tinto plc (ADR) (NYSE:RIO)? At Q3’s end, a total of 18 of the hedge funds tracked by Insider Monkey held long positions in this stock, a drop of 14% from the second quarter of 2016. Below, you can check out the change in hedge fund sentiment towards RIO over the last 5 quarters. With hedge funds’ positions undergoing their usual ebb and flow, there exists a select group of key hedge fund managers who were increasing their holdings substantially (or already accumulated large positions). Of the funds tracked by Insider Monkey, Robert Bishop’s Impala Asset Management has the largest position in Rio Tinto plc (ADR) (NYSE:RIO), worth close to $112.2 million, accounting for 7.4% of its total 13F portfolio. The second most bullish fund manager is Luminus Management, led by Jonathan Barrett and Paul Segal, holding a $98.9 million position; 2.5% of its 13F portfolio is allocated to the stock. Remaining peers that are bullish include Jim Simons’s Renaissance Technologies, Ken Heebner’s Capital Growth Management and Peter Rathjens, Bruce Clarke and John Campbell’s Arrowstreet Capital. We should note that two of these hedge funds (Impala Asset Management and Luminus Management) are among our list of the 100 best performing hedge funds which is based on the performance of their 13F long positions in non-microcap stocks. How Big Lots, Inc. (BIG) Stacks Up To Its Peers Infosys Ltd ADR (INFY): Are Hedge Funds Right About This Stock? Has Hedge Fund Ownership in Welltower Inc. (HCN) Finally Bottomed Out? Should You Buy BJ’s Restaurants, Inc. (BJRI)? Biotech Movers: Heat Biologics Inc (HTBX) And Achaogen Inc (AKAO) Is WebMD Health Corp. (WBMD) A Good Stock To Buy?